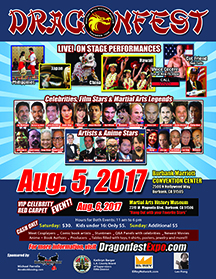 The most popular martial arts convention on the West Coast! Dragonfest! The martial arts version of San Diego’s COMIC CON, you will have a great time meeting the stars, seeing the cultural performances, enjoying the artists, greeting the icons, buying some very cool toys, weapons and more! 11 am to 6 pm. CASH ONLY at the door. Visit us at www.Dragonfestexpo.com. You don’t want to miss this! It’s our Red Carpet, VIP Event at the Museum. Here, you can not only enjoy the museum, but hang out with many of the stars from Dragonfest. From Don Wilson to Cynthia Rothrock to Benny Urquidez to Art Camacho and many more. Finger foods will be provided. Hey, how cool is this. Instead of pushing your way through the crowds at Dragonfest to meet your favorite star, now you can hang out all day with them. 11 am to 6 pm. From ET to Back to the Future to the Karate Kid to La Bamba, the drive-in is back! At least temporarily, beginning August 4 in Lake Balboa (Van Nuys). Take the kids, take the family and enjoy opening festivities, food entertainment, martial arts demonstrations and more. See Carrie Ogawa-Wong in person!!! Visit www.Myvalleypass.com. Museum Productions is proud to introduce award-winning film director Art Camacho's new book. This is wonderful look at the person life of Art Camacho, the challenges he faced, how he got into filmmaking and his advice to you if you want to pursue a career in films. There will be the first ever, BOOK SIGNING at the Dragonfest. You can't get it on Amazon yet, Dragonfest will be the first place you can purchase this book and have Art sign them in person.